We invite you to visit, with us, the landscapes, natural and man-made wonders of our country, as well as the people, products and business ventures that keep it all together. Only after gaining written permission from us, may you use any of images you find here (always appending all credit applicable to the U.S. copyrighted photos) in your own not-for-profit web site, reports or illustrations.ï¿½ Please do not attempt to sell, barter or otherwise use them for any value however as they are registered and an infringement case will result! 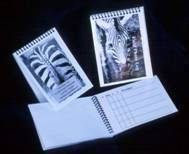 The booklet has plastic coated pages with space for recording forty (40) exposures using the included ï¿½Vis-ï¿½-Visï¿½ wet erase marker and the pages can be wiped off and then reused until they basically rot away!ï¿½ The spiral bound book is approximately four (4) inches wide by five (5) inches long and about one-half inch thick.ï¿½ It sells for $15.95ï¿½ US which includes shipping in the Statesï¿½ - outside USA will have additional shipping charge added. Click on the box below to place a secure credit card order for one or more ï¿½Field Photo Logï¿½ Books! ** outside US pays additional shipping!